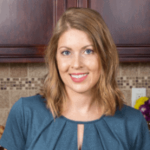 Published: Dec 4, 2017 · Modified: Apr 11, 2019 · By Jen Sobjack · This post may contain affiliate links. 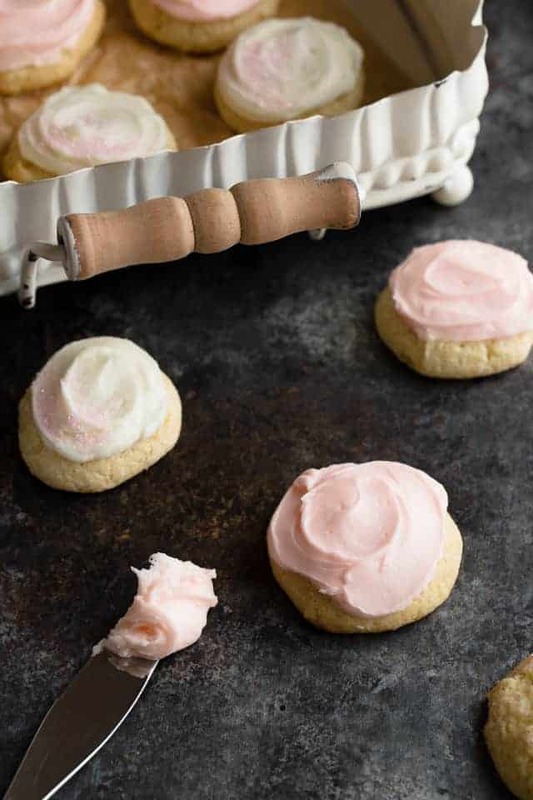 Old-fashioned Sour Cream Cookies are soft, lightly sweet, and so easy to make that they barely require any effort. You’ll want to make these all year because they’re so irresistible! It is the time of year where we’re all baking nothing but cookies! Hello holiday baking!! I recently shared delightful classic sugar cookies and chewy gingersnap cookies that make wonderful edible gifts for Christmas. And today I have another cookie that will win the hearts of whoever tries them. I mentioned before I have a friend who grew up in the midwest. Her grandmother passed down a very old church cookbook filled recipes that had easy to access recipes. I browsed through this book and found so many wonderful recipes to try! Remember this pumpkin jam from early fall? That was one of the recipes I adapted from the book. Today I’m sharing another. Old-Fashioned Sour Cream Cookies. They are so incredibly soft and sweet. And they require ingredients that you most likely have on hand. 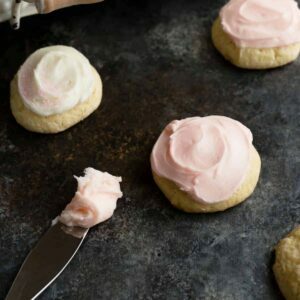 Adding sour cream to a basic cookie base produces a soft, creamy cookie. You can taste an ever so slight tang and ultimate richness from the sour cream. In addition to the sour cream, there’s a splash of vanilla extract for flavor. You can also use almond extract or a combination of both. 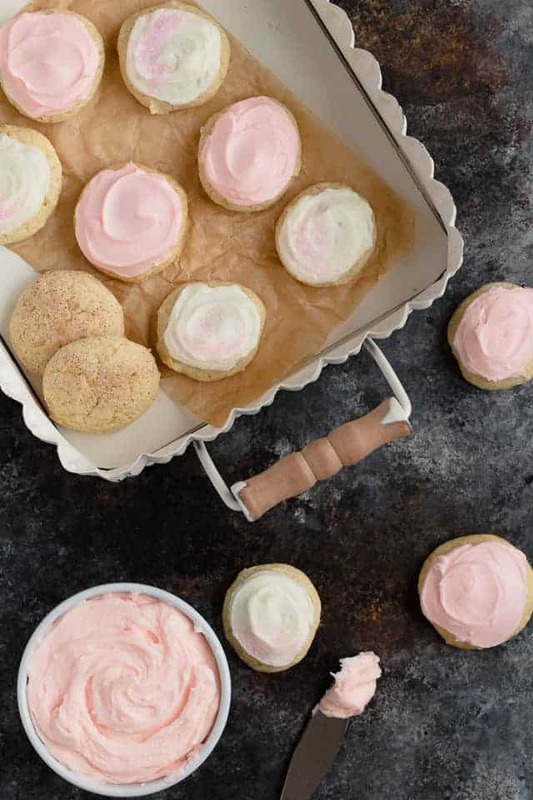 The best thing about this sour cream cookie dough is it doesn’t require chilling. The dough is supposed to be soft, almost like a thick cake batter. Spoon the dough out onto a parchment-lined baking sheet and press each cookie flat with the bottom of a glass dipped in sugar. The sugar will help prevent the dough from getting stuck to the bottom of the glass. 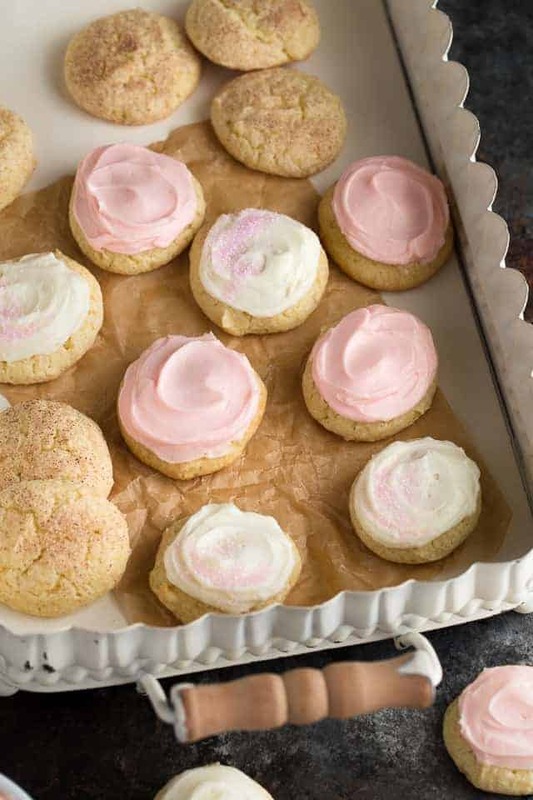 These cookies are great plain with a sprinkle of cinnamon and sugar or frosted with sour cream frosting. I like to use the frosting and color it so the cookies look extra pretty. They’d also look fancy with a sprinkling of sanding sugar. 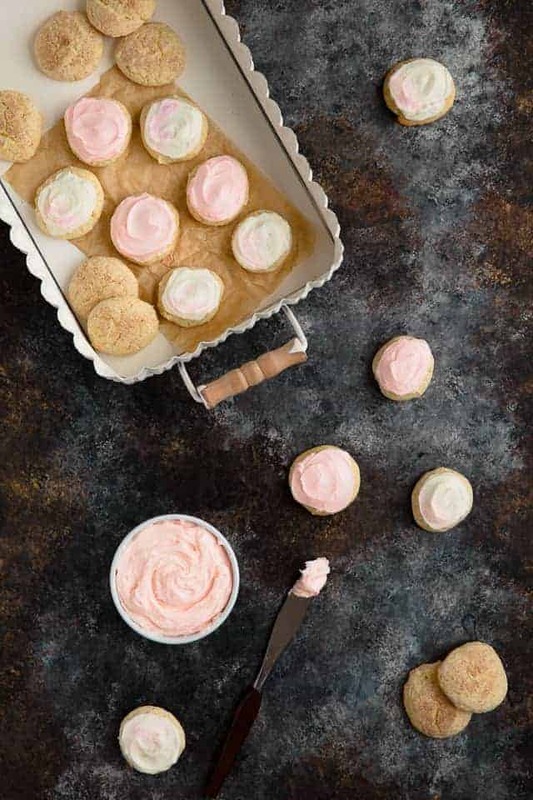 You choose how you want to decorate your sour cream cookies! Preheat the oven to 350°F. Line a baking sheet with parchment paper; set aside. In a large bowl using a hand-held or stand mixer fitted with a paddle attachment, beat the butter and sugar on medium-high speed until fluffy and pale in color. Beat in the egg and vanilla on high speed, followed by the sour cream. Scrape down the sides and bottom of the bowl as needed. Whisk the flour, baking powder, salt, and baking soda together until combined. On low speed, slowly mix the flour mixture into the sour cream mixture until combined. The dough will be soft, almost like a thick cake batter. Drop tablespoons of dough onto the prepared baking sheet about 2 inches apart. Press each cookie flat with the bottom of a wet glass dipped in sugar. Bake for 10-12 minutes or until very lightly browned around the edges. Rotate the pan once halfway through baking. Cool for 5 minutes on the cookie sheet then transfer to cooling rack to cool completely before frosting. In a medium bowl using a hand-held mixer or stand mixer fitted with a whisk attachment, beat the butter and sour cream on medium-high speed until creamy and smooth, about 2 minutes. The cookies will keep for up to 3 days stored in an airtight container at room temperature or up to 1 week in the refrigerator. Baked unfrosted cookies will keep for up to 3 months stored in the freezer. Thaw in the refrigerator overnight and bring to room temperature before serving. Instead of frosting, you can sprinkle a mixture of 2 tablespoons granulated and 1/4 teaspoon cinnamon over the cookies just before baking.